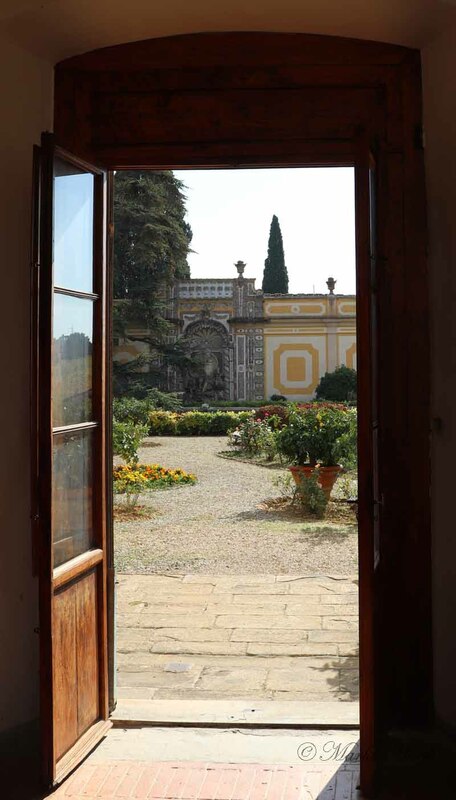 The view is a vista of rolling hills filled with grape vines turning yellow and rust in front of me and of a Renaissance villa behind me. 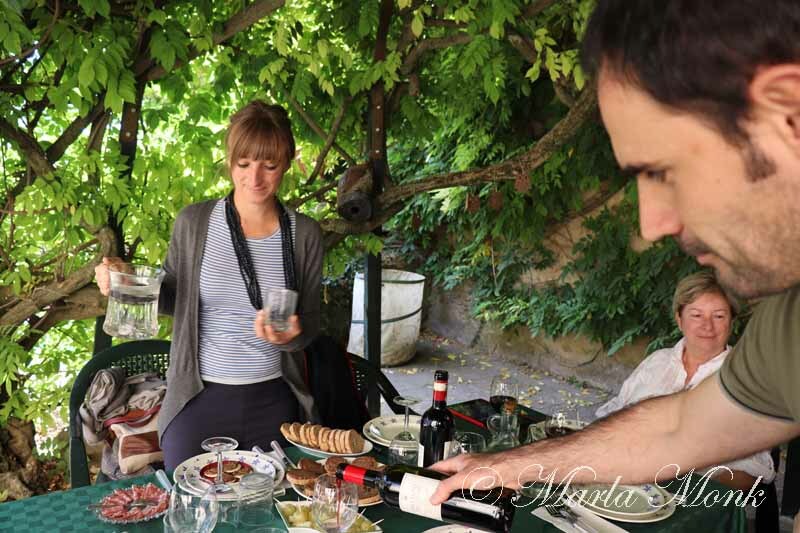 My plan to offer a review of The Best Wine Tasting in Tuscany looks simple enough, but to do the actual experience justice is another task altogether. Our group of three girlfriends has been with Arianna and Alessio of KM Zero Tours for a little more than a day now. Our guides are professionals who have easy-going, understated demeanors. They treat us like old friends, embracing us, making us comfortable from the beginning. KM Zero Tours exhibits the “slow travel” movement’s philosophy which lets the visitor experience products on a personal level and absorb the culture of local producers. With KM Zero’s arrangements, we are staying in a 600 year-old Tuscan farmhouse on an active olive farm, which is spectacular. It’s a combination of historic, original structure and comfortable updated amenities. 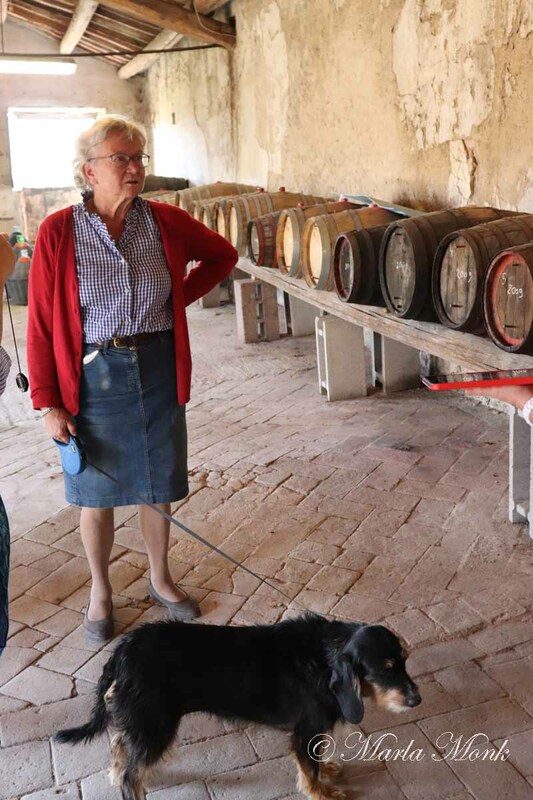 Alessio drives the van for our excursions — so far we have experienced a bread making class, a truffle hunt and lunch, and an olive oil production plant during the harvest season. Arianna acts as tour guide and translator. Today’s tour is of a local Tuscany winery. But we aren’t walking into a commercial building or processing facility. We are at someone’s home. 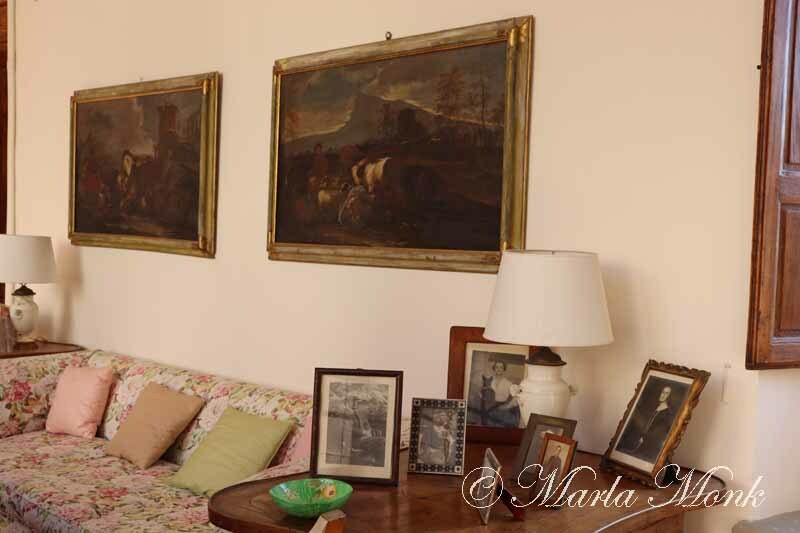 Arianna introduced the three of us to a gracious lady and hostess, Anna Maccaferri, who for the next several hours painted the picture of her family’s home and business of over 600 years. 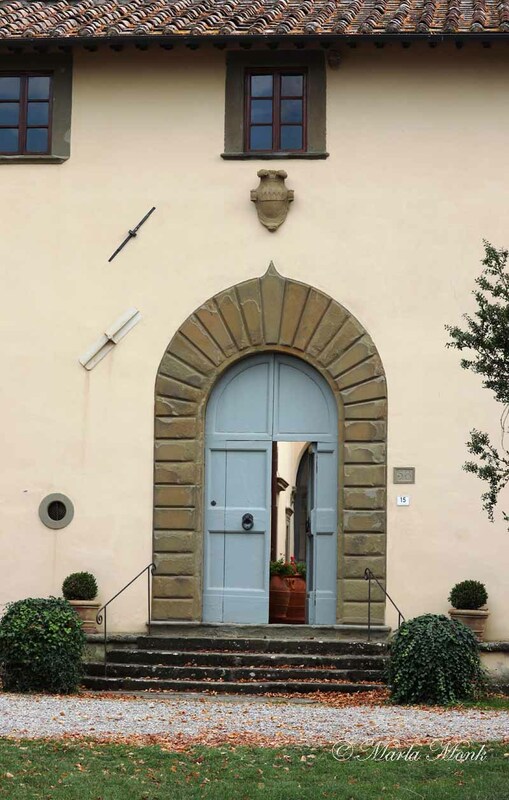 The winery and villa were built during the Renaissance in the second half of the 15th century on a pre-existing medieval site. 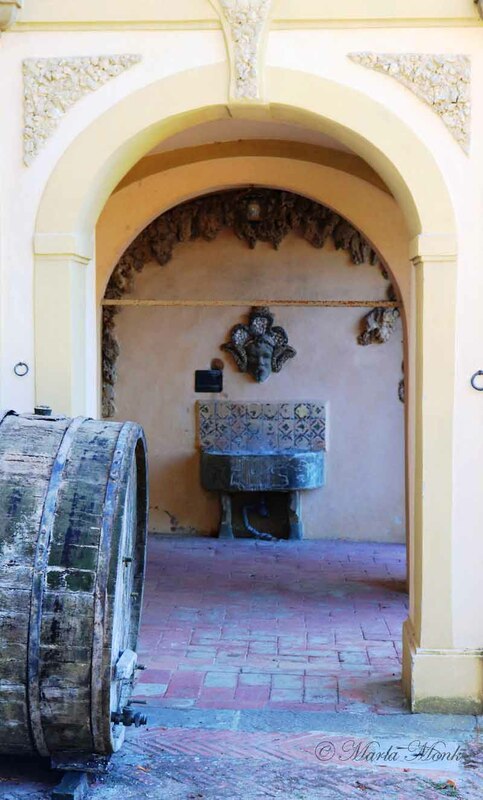 It still belongs to the Antinori family. 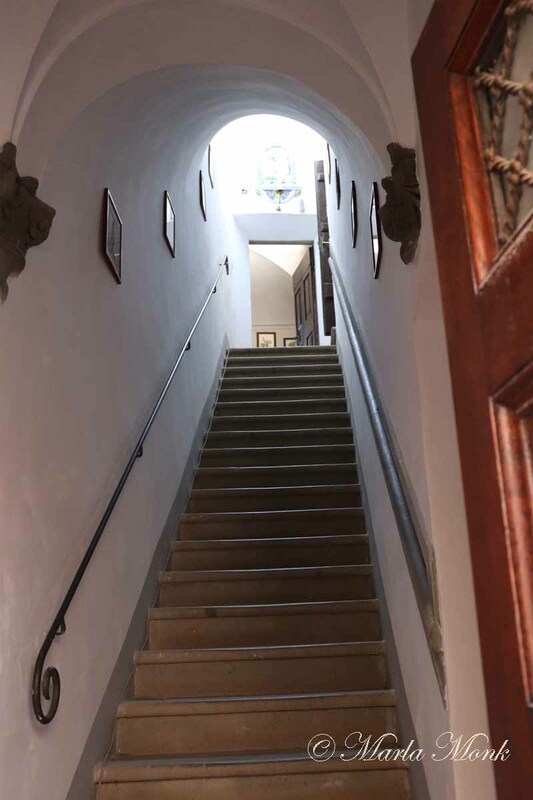 The villa’s historic architecture and exterior detail catch my eye as we go into the wine cellar on the basement level. 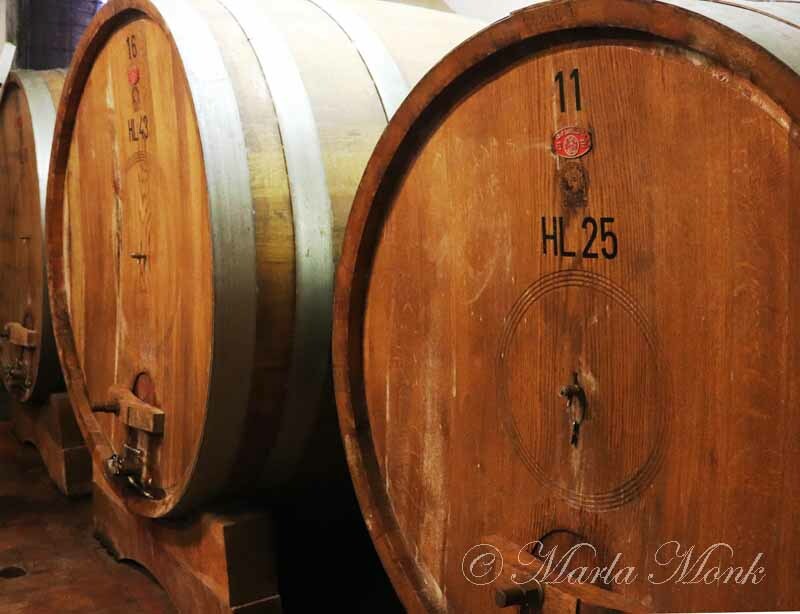 Big oak wood casks are still used in the process of aging the Chianti Classico wine made from the estate’s 60-acre vineyard. 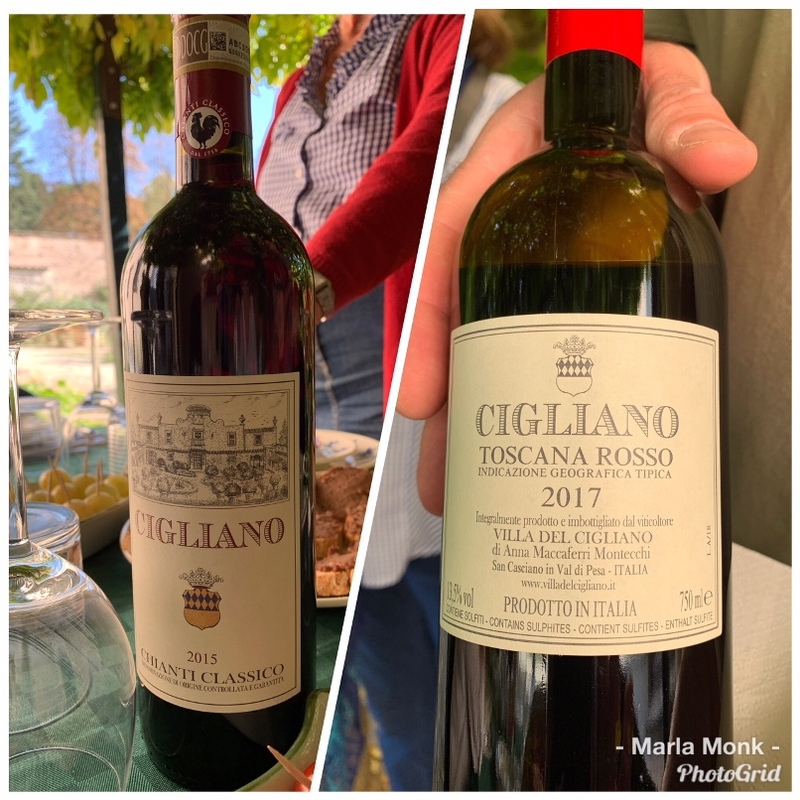 Certain characteristics and strict guidelines, including the type and blend of grapes, maturation time, and alcohol content contribute to the classification of Chianti Classico, which has been produced in the region for over 2000 years. 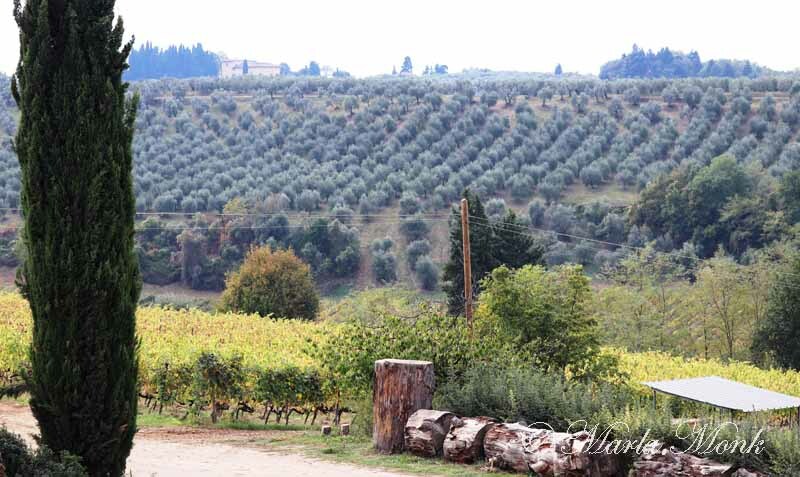 An olive grove of over 5000 trees and olive oil production are also part of the working estate. Back in the bright sunlight, pointing to the hills, Anna tells us of the region’s rich history through the story of the Black Rooster. About 800 years ago there was a territorial dispute between Florence and Siena over the vast land of grape vineyards. In order to settle the feud and define the boundaries, the two cities agreed to send a rider from their city at the first rooster’s crow, into the countryside. The location of the two rider’s meeting would determine the boundary. Siena selected a white rooster, kept him in a sunny room, fed him and treated him well. Florence’s black rooster was kept in a dark, damp room with little food or attention. On the designated day, the white rooster overslept, having been pampered too much. The black rooster was mad and hungry, therefore waking and crowing much earlier than dawn. This gave the rider from Florence a distinct advantage and a head start. When the two riders met, the Siena rider had made it less than 12 kilometers from the start. 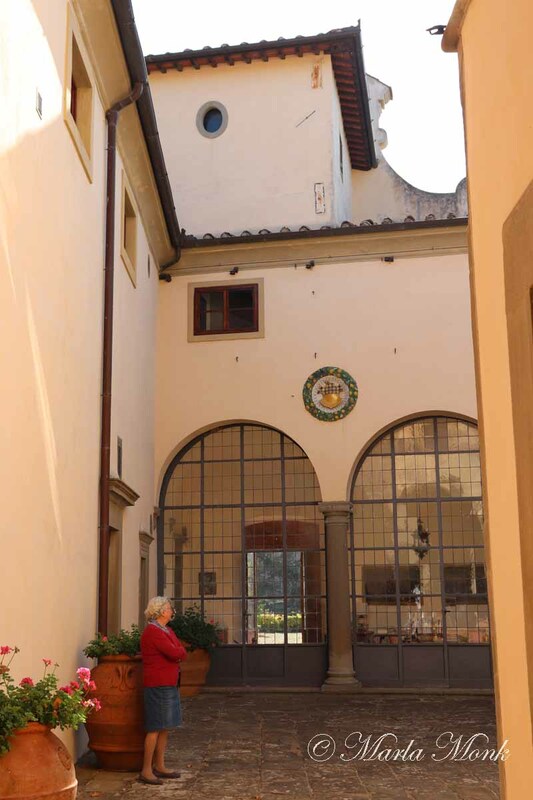 Florence secured the largest portion of the land and wine production ensued. The black rooster was adopted as the official emblem by the League of Chianti in 1384 and continues to this day. 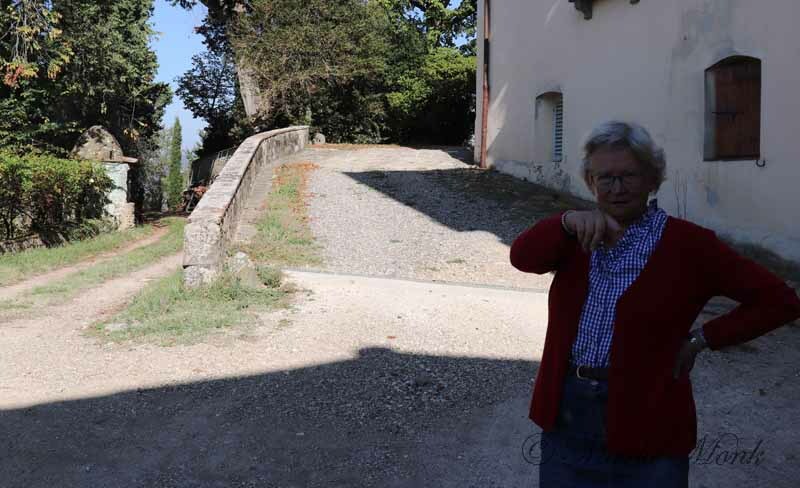 Our hostess, Anna, continues with an easy manner to tell us about her family and the estate’s production of wine. It becomes obvious she is both a historian and great story-teller. 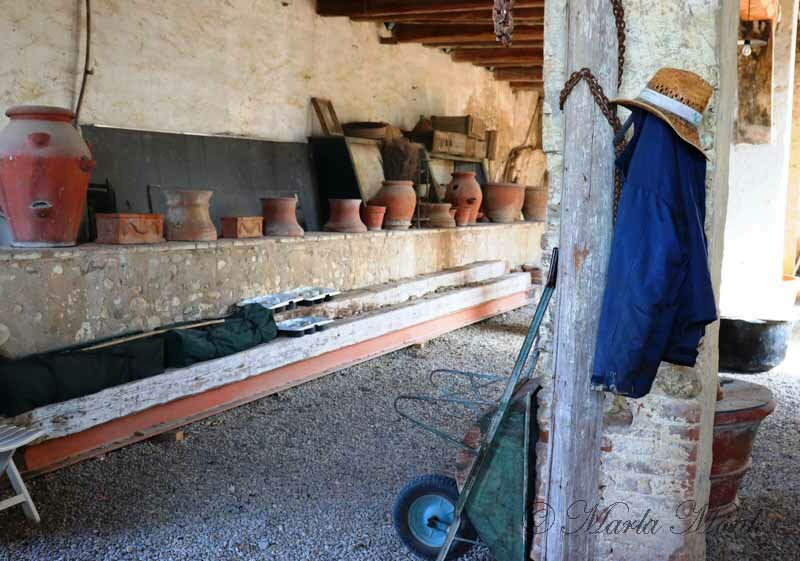 We follow into a courtyard with terracotta flower pots, formerly used to store olive oil and a water well that looks like something from a movie set. On display are two coats of arms, of the Antinori and Tournabuoni families. 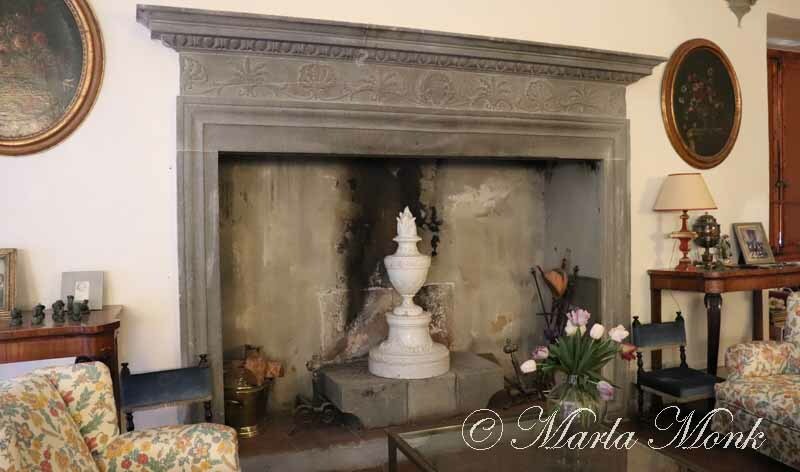 Books line shelves under antique oil paintings and the original working fireplace is in the living room. 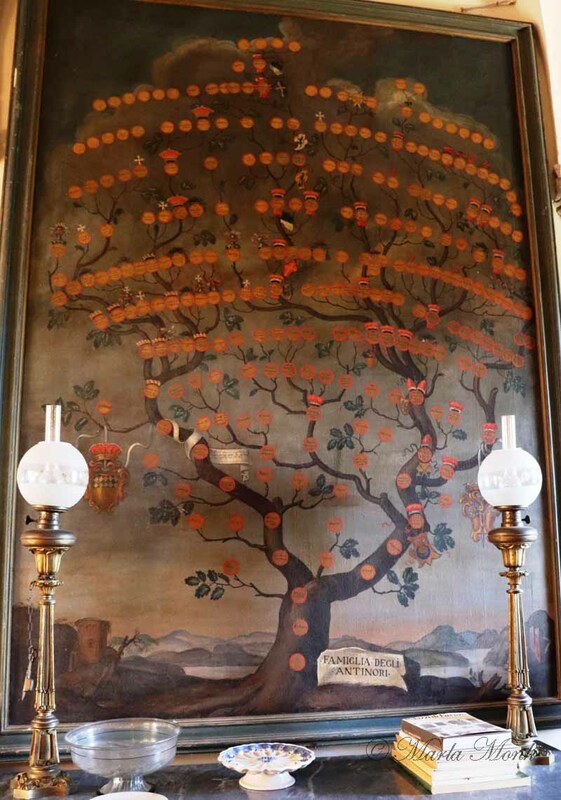 A splendid painting of a family tree states: “Famiglia.Degli.Antinori” at its base. 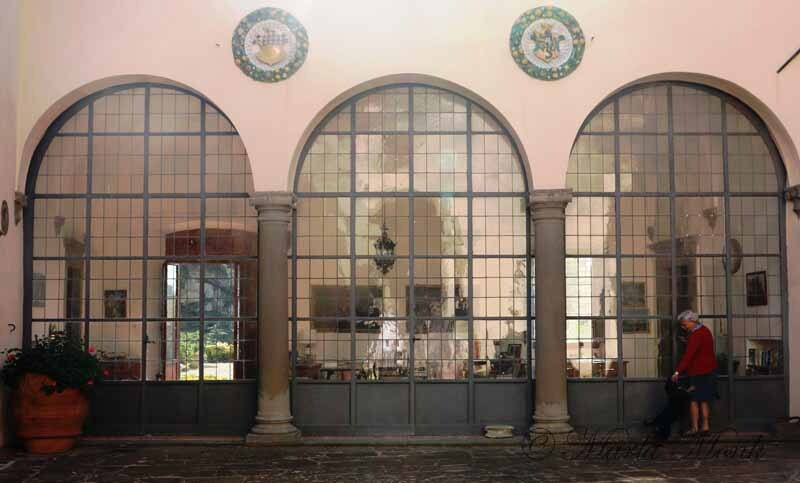 The original arched walk-way has been enclosed as a sun room where family photos are displayed. Anna shows us brochures of special events held on the property, including concerts, art shows, and more. The moment we step from the sun room into the garden my feet no longer move. Standing alone, I pause to take it all in. 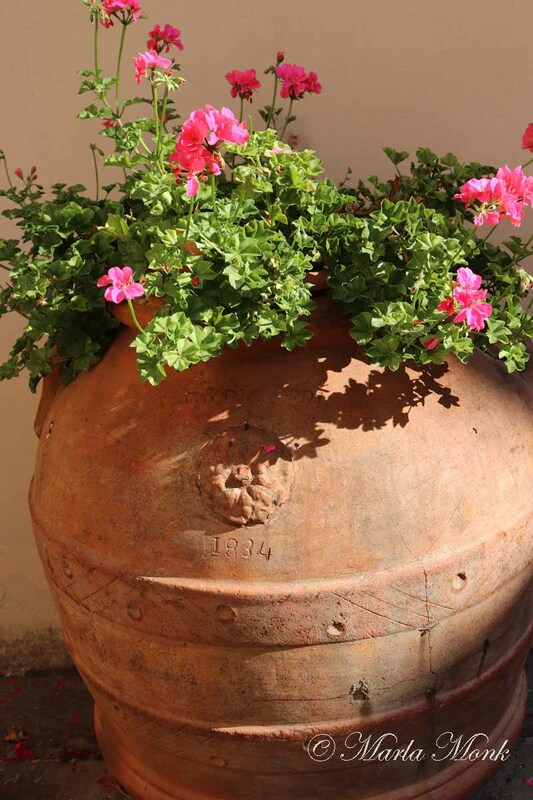 I smell roses combined with lemons and limes–small trees growing in huge pots. 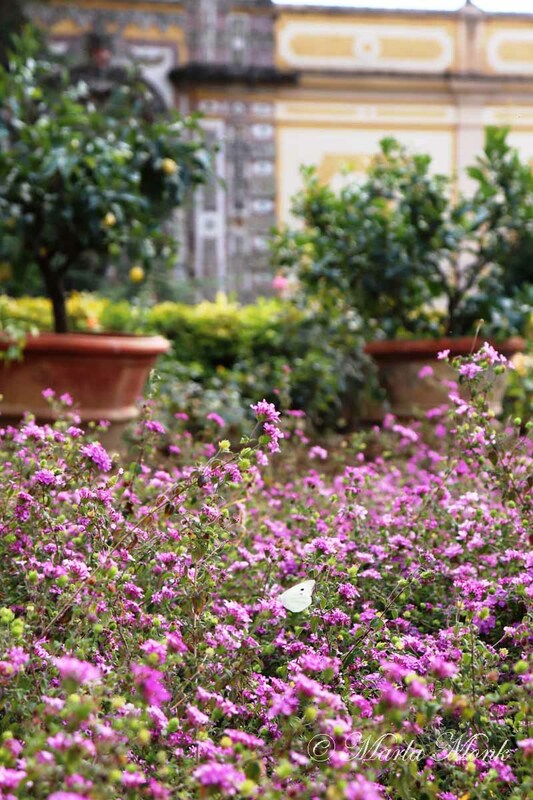 Dozens of yellow butterflies flutter around purple flowers. The power of the place hits me like a wave. I can scarcely comprehend the history and beauty without my heart overflowing. I spot an ancient mosaic, an ornate sculpture built into a huge wall. I run to catch up, so not to miss Anna’s explanation. It is a nymphaeum, a distinct architectural style dating to the Roman Empire, designed as monuments to nymphs, specifically those of the streams. 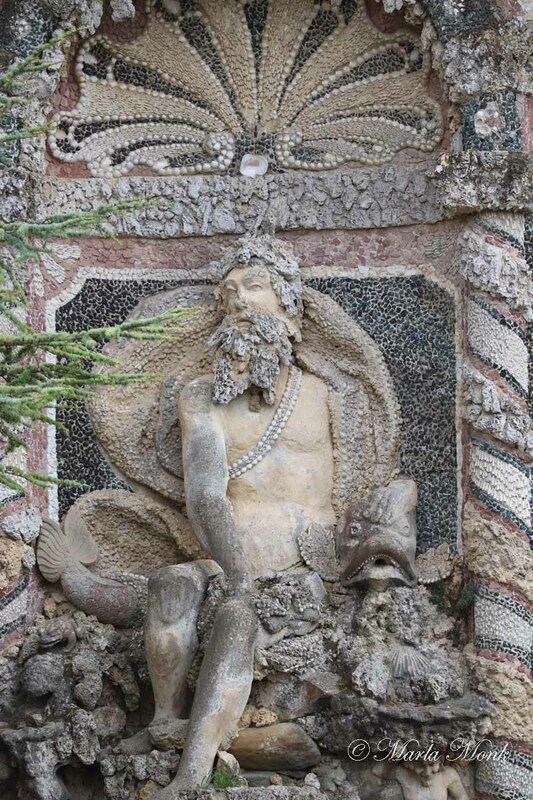 The sculpture is Neptune, the god of water. He’s made of river stones, shells, and marble. 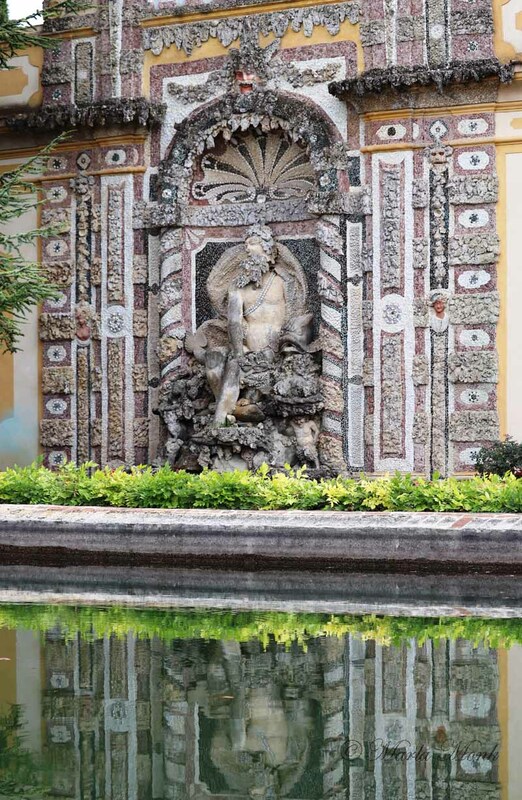 “See the little fellow with the angry expression?” Anna points out the faces of architectural sculpture flanking Neptune. This type of adornment is a face, known as grotesque, and is used to divert water away from and preserve stonework. The sculpture overlooks a reflecting pool. From our first vantage point, we see the nymphaeum in the water. We move close to the mosaic and look back towards the house. 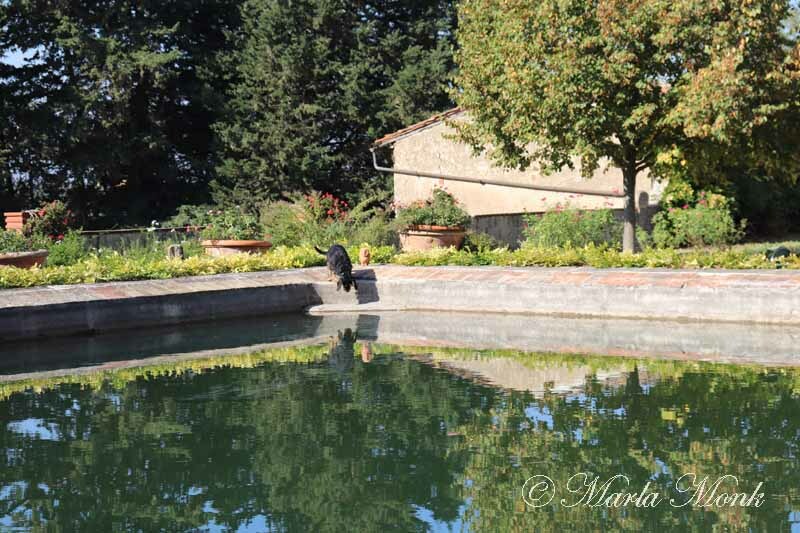 The reflection now is of the magnificent gardens and house. 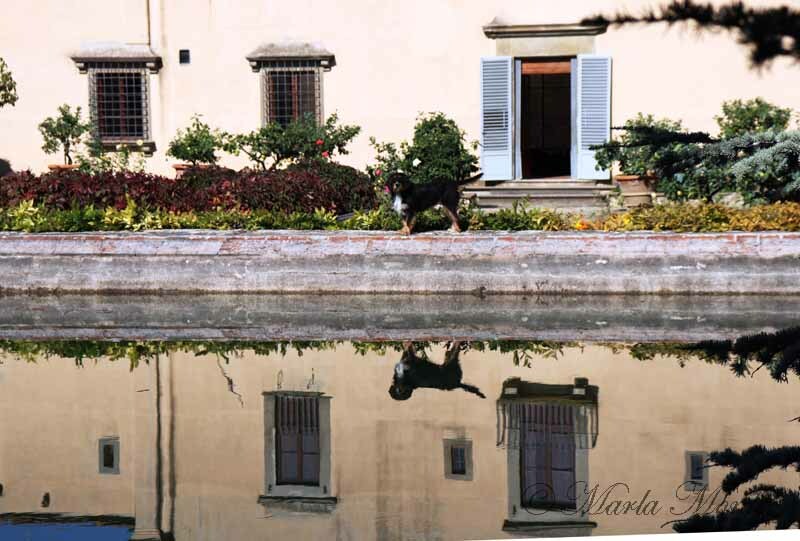 Anna’s dog walks along the pool edge looking at himself, taking a drink. A door is painted onto the left side of the wall by the mosaic to match the actual door leading inside on the right. This was an architectural fashion of the day to invoke symmetry. 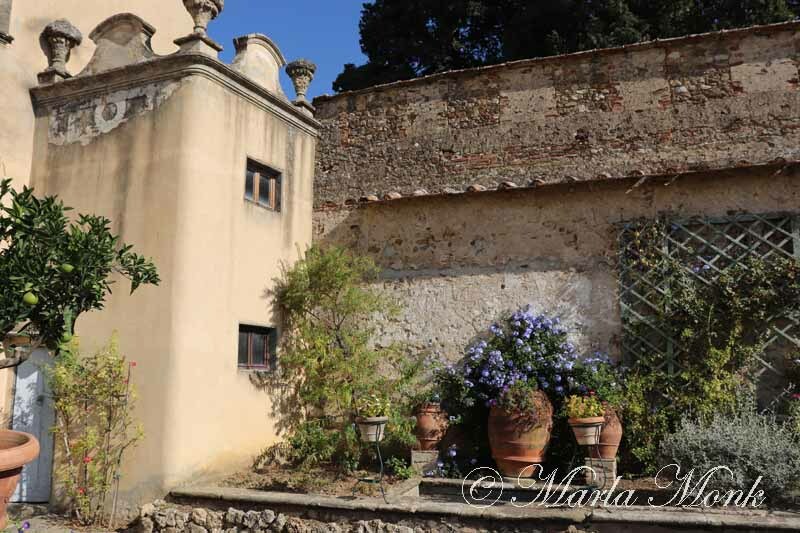 The gardener’s room and limonaia, where the lemon trees are taken in during cold weather, indicate the hard work required to maintain the garden. I photograph garden tools hanging on the walls. Anna says they’re hanging just as the gardener left them. 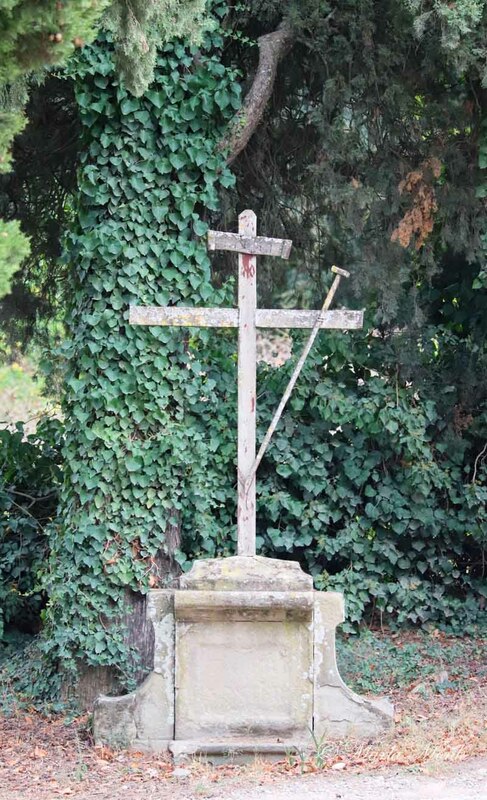 “He was with us for more than 50 years and was more than our gardener; he was a friend to our family.” I can tell by her wistful expression and tone of voice that he was significant to her. She asks to see the photos from my camera. 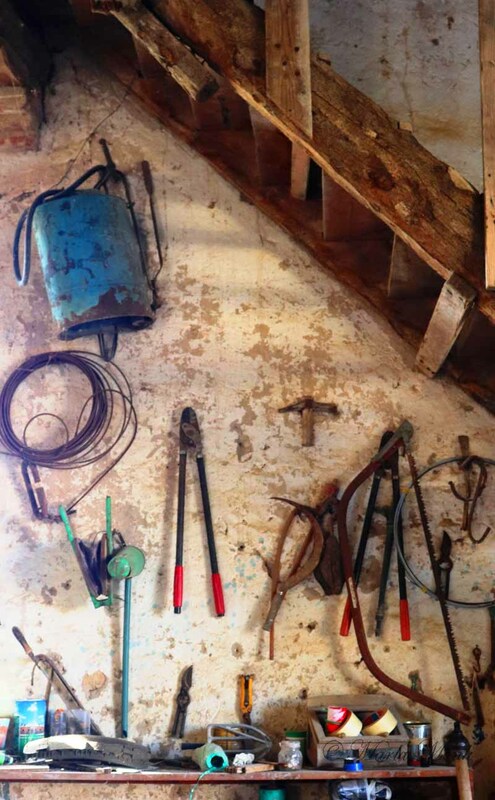 “No one has taken photographs of the tools before,” she says. 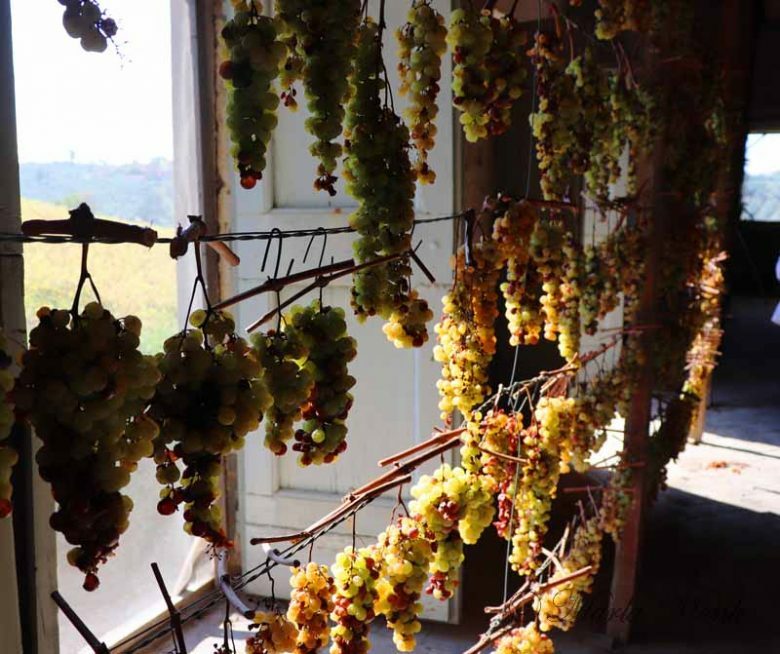 Two long rows of grape bunches dangle in splendor in the sunlight coming from the windows. They are turning various colors as they dry. 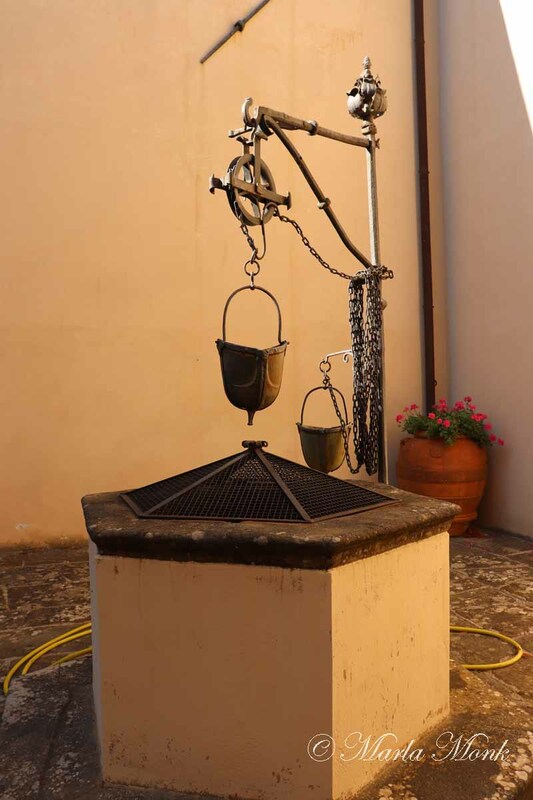 They will be used to make Vin Santo, a sweet dessert wine and for Holy Communion wine. The grapes we see hanging will be aged on site in the large oak barrels for at least three years before being released on the market. I’m in a bit of a daze, having taken in so much. Anna leads us to a table set for lunch outside in the garden–complete with tablecloth, wine glasses, and perfect place settings. I am seated before I look up to see the “roof” over our heads. There is one large wisteria vine with twining vines as big around as my arms. It twists and arches up and over, making a perfect cooling canopy from the sun. We are treated to two delicious red wines, both of them full and wonderful. One has the Black Rooster logo on the bottle. I can see the riders meeting on the road between Florence and Siena. The wine flows freely with easy conversation between hostess and guests. 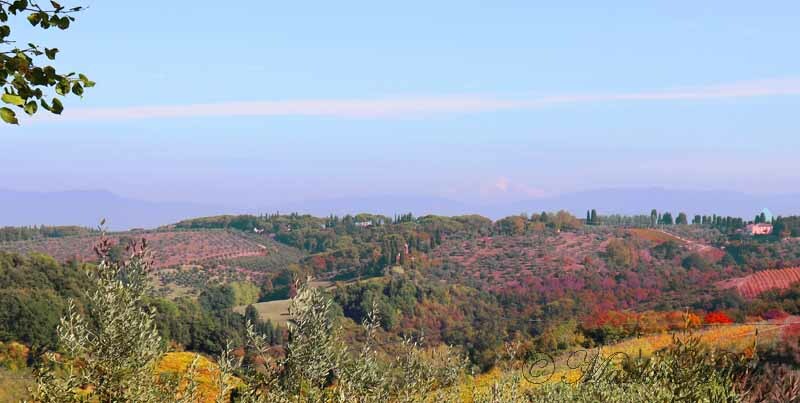 From our point of view we have been given a rare gift, along with the best wine tasting in Tuscany. Food arrives seamlessly. From the house Arianna and Alessio retrieve dishes of fresh antipasta appetizers, which we eat until we’re stuffed. Then fresh pasta as a main course. We ask who prepared the food. Arianna modestly replies, “the three of us prepare the meal.” When I think I can’t take another bite, Anna presents a fresh blackberry tart, complete with the flakiest crust I can imagine. Our winery tour was leisurely and intimate. Our hosts for the day gave us something your typical tour company cannot. Arianna and Alessio introduced us to one of their close friends. 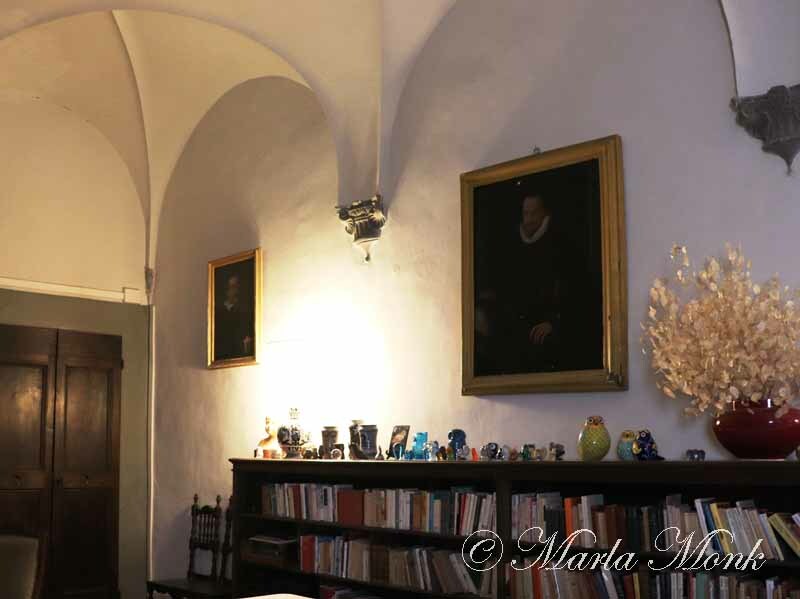 Anna opened her home, Villa del Cigliano, and we become more than tourists. 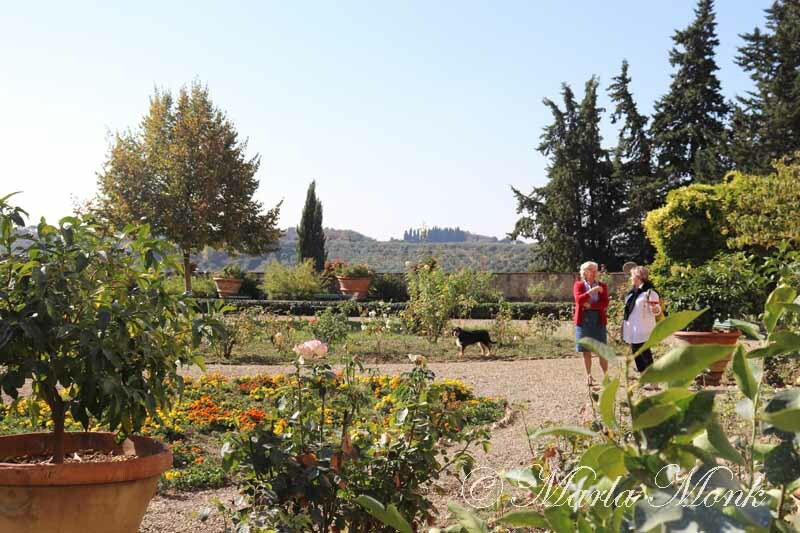 We were treated to a look into a home, a family, a bit of history of the Renaissance, and of a gardener’s pride. 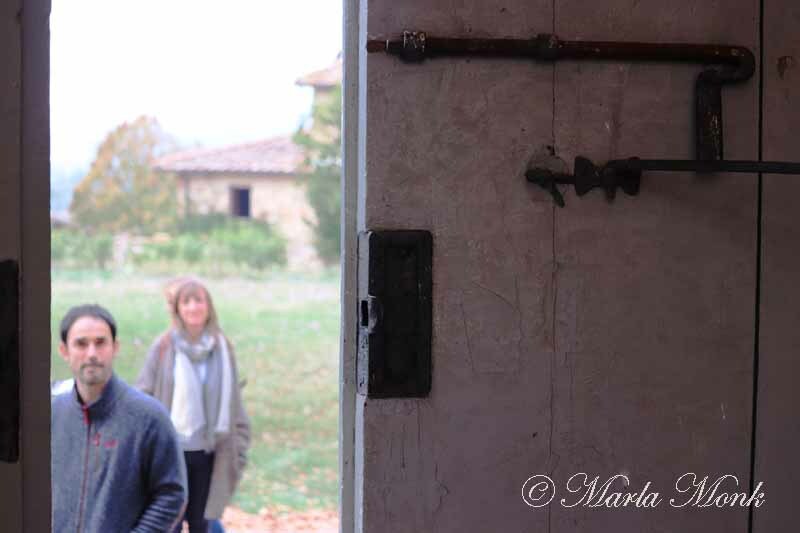 It was so much more than the best wine tasting in Tuscany for three traveling girlfriends. It was an experience of a lifetime. 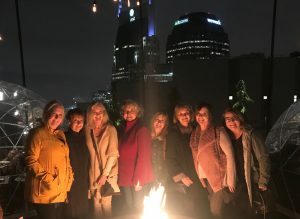 We highly recommend KM Zero Tours for a girlfriend trip or any trip to Italy. A huge thank you to KM Zero Tours for their generous hospitality. 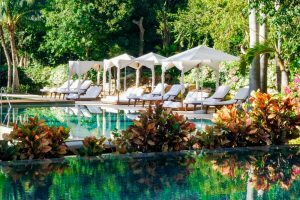 We received a discount on our tour as professional bloggers, but as always, all opinions are our own. 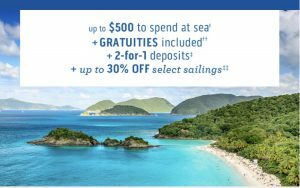 First cruise sale begins May 1, 2019 for Grans on the Go Alaska July 11, 2020 Cruise.